This lilac has glossy dark green leaves that set off the stunning blue flowers. It is fast growing and adaptable.It grows to 10' high and 5' wide with an upright, dense form. 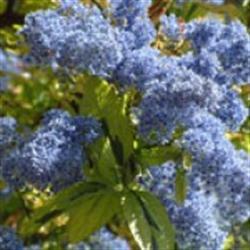 The Ceanothus grows great in clay soils especially the shaley clay soils, as well as more well-drained soils. It is thought to be a hybrid of Ceanothus oliganthus var. sorediatus and Ceanothus thyrsiflorus var. griseus and was introduced by Bert and Celeste Wilson of Las Pilitas Nursery in 1991.